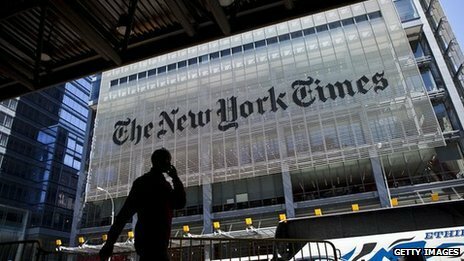 HAS SYRIA ‘DECLARED WAR’ ON THE NEW YORK TIMES? They seem to think so …. How will zion get its message out if they remain offline? Analysts said evidence showed a group supporting Syrian president Bashar al-Assad was behind Tuesday’s attack. The New York Times website has gone offline for the second time this month after what the company described as a “malicious external attack”. Mark Frons, the company’s chief information officer, warned New York Times employees the attack was perpetrated by the Syrian Electronic Army, which backs Mr Assad, “or someone trying very hard to be them”. He cautioned staff to “be careful when sending e-mail communications until this situation is resolved”. “The NYTimes.com domain is pointing at SyrianElectronicArmy.com which maps to an IP address in Russia, so it’s clearly a malicious attack,” Ken Westin, a security researcher for Tripwire, an online security company, told the BBC. In a separate posting on Tuesday, the group also claimed responsibility for hacking Twitter’s administrative contact information. ‘More attacks’Recently, the Washington Post, CNN and Time magazine websites were targeted in attacks attributed to supporters of the group. “Media attacks seem to be escalating and moving away from annoying, simple denial of service attacks and toward full domain compromise which, if successful, puts millions of NYT website users at risk,” said Mr Westin. In January, the New York Times said hackers had accessed its website and stolen the passwords of 53 employees after it published a report on the wealth of China Premier Wen Jiabao’s family. Hi there….just wondering whether this take down of the NYT has anything to do with the 9/11 truth movement’s plan to place ads in the newspaper in the run up to the 9/11 anniversary. I read somewhere that they had raised a sizable amount of money to place large ads informing New Yorkers about the controlled demolition of WTC7. I hate to break it to the NYT but, they have little impact on what people think or believe…other than provide the flip side.